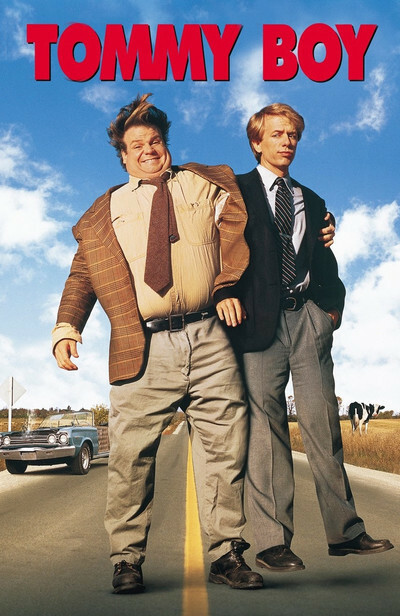 "Tommy Boy" is one of those movies that plays like an explosion down at the screenplay factory. You can almost picture a bewildered office boy, his face smudged with soot, wandering through the ruins and rescuing pages at random. Too bad they didn't mail them to the insurance company instead of filming them. The movie is an assembly of clichés and obligatory scenes from dozens of other movies, all are better. It has only one original idea, and that's a bad one: The inspiration of making the hero's sidekick into, simultaneously, his buddy, his critic and his rival. It's like the part was written by three writers locked in separate rooms. "Tommy Boy" stars Chris Farley of "Saturday Night Live," the guy with the size 23 neck, as Tommy Callahan, the dopey son of a Sandusky brake shoe manufacturer. His father, Big Tom (Brian Dennehy), is proud of him even though he squeaked through college in seven years, and supplies him with an office and big responsibilities when he comes back to Ohio. Meanwhile, there are startling developments on the domestic front, where Big Tom, a widower, is engaged to marry the bodacious Beverly (Bo Derek). Young Tommy is overjoyed, because Beverly has a son, Paul (Rob Lowe), which means Tommy at last will have the brother he always dreamed of. Paul doubts there's much to do in Sandusky, but Tommy proves him wrong, introducing him to the favorite local pastime, "cow tipping," which means sneaking up on sleeping cows and tipping them over. In other hands this could have been the movie's only funny scene, but director Peter Segal doesn't have a clue about comic payoffs and bungles it before ending with the desperate director's ancient standby, as the lads fall in the mud. The plot thickens. Or does it congeal? I began ticking off the story clichés: We'd already had (1) dumb son returns to family business and (2) unexpected stepmother. Soon we get (3) company gets in trouble and all workers will lose jobs, (4) it's up to the kid to save the day, (5) evil stepmother, (6) road movie and (7) buddy picture. The last two come as Tommy hits the road in a desperate last-minute bid to sell brake shoes, accompanied by his friend Richard (David Spade, also from "Saturday Night Live"). Richard has been introduced as a resentful employee who doesn't think Tommy should get such a quick promotion. Now he becomes a sidekick, critic, rival and buddy, all wrapped in one ungainly package. The movie tries for laughs during the road trip, I'm afraid, by having Richard's car fall to pieces. First a deer destroys the convertible roof. Then a door comes loose. Then the hood flies off. They drive down the highway in what's left. Those whose memories stretch all the way back . . . back . . . back to the dim past of 1987 will remember a similar demolished car in "Planes, Trains and Automobiles," one of the many better movies this one rips off. No one is funny in "Tommy Boy." There are no memorable lines. None of the characters is interesting except for the enigmatic figure played by Rob Lowe, who seems to have wandered over from "Hamlet." Judging by the evidence on the screen, the movie got a green light before a usable screenplay had been prepared, with everybody reassuring each other that since they were such funny people, inspiration would overcome them. It was Forrest Gump, I believe, who said, "Funny is as funny does."